Henry, Natasha L.. "Underground Railroad". The Canadian Encyclopedia, 15 March 2018, Historica Canada. https://www.thecanadianencyclopedia.ca/en/article/underground-railroad. Accessed 20 April 2019. Due to a provision in the 1793 Act to Limit Slavery, which stated that any enslaved person who reached Upper Canada became free upon arrival, a small number of enslaved African Americans in search of freedom began to enter Canada, primarily unassisted. Word that freedom could be had in Canada spread further following the War of 1812 when the enslaved servants of US military officers from the South brought back word that there were free “Black men in red coats” in British North America. 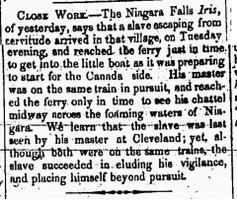 Arrivals of freedom-seekers in Upper Canada increased dramatically after 1850 with the passage of the American Fugitive Slave Act, which empowered slave catchers to pursue fugitives in Northern states. The Underground Railroad was established in the early 19th century by a community of abolitionists based primarily in Philadelphia. Within a few decades it had grown into a well-organized and dynamic network. The term “Underground Railroad” began to be used in the 1830s, coinciding with the advent of railway technology, and long after an informal covert network to aid fugitive slaves had commenced. 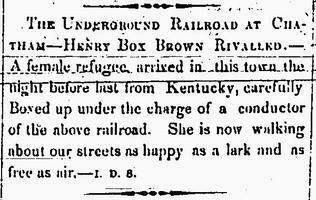 The Underground Railroad was not an actual railroad and it did not actually run on railway tracks. It was a complex, clandestine network of people and safe houses that helped persons enslaved in Southern plantations reach free soil in the North. The network was maintained by diverse abolitionists who offered assistance to fleeing slaves and who were committed to human rights and equality. Their ranks included free Blacks, fellow enslaved persons, white and Aboriginal sympathizers, Quakers, Methodists, Baptists, inhabitants of urban centre and farmers, men and women, Americans and Canadians. Railroad terminology and symbols were adopted to mask the covert activities of the network and to keep the public and slaveholders in the dark. Those who assisted escaping slaves in their journey were called “conductors.” They guided fugitives along points of the Underground Railroad, using various modes of transportation over land or by water. One of the most famous conductors was Harriet Tubman. 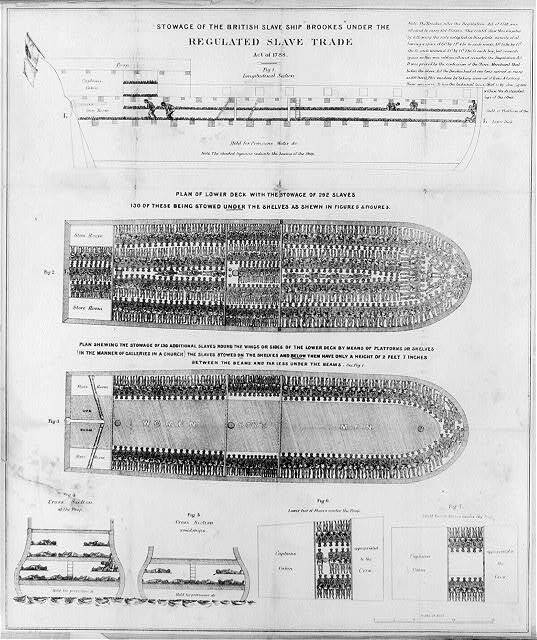 The terms “passengers,” “cargo,” “package” and “freight” referred to escaped slaves. Passengers were delivered to “stations” or “depots,” which were safe houses. Stations were located in various cities and towns, known as “terminals.” These places of temporary refuge could sometimes be identified by lit candles in their windows or by strategically placed lanterns in the front yard. Safe houses were operated by “station masters.” They received escapees into their home and provided meals, a change of clothing, a place to rest and hide, and financial assistance before sending them to the next transfer point. Black abolitionist William Still was in charge of a station in Philadelphia, Pennsylvania. He assisted many freedom-seekers in their journey to Canada and recorded the men, women and children who stopped at his station, including Tubman and her passengers. Jermain Loguen was another Black station master and leader in the abolitionist movement. He ran a station in Syracuse, New York, where he permanently settled after living freely in Hamilton and St. Catharines, Upper Canada, from 1837 to 1841. Well known for his public speeches and written contributions to anti-slavery newspapers, Loguen was known as the “Underground Railroad King.” Numerous women were station masters. Quaker women Lucretia Mott and Laura Haviland, and Henrietta Bowers Duterte, the first Black female undertaker in Philadelphia, are just a few. Many other women also worked with their husbands to operate stations. The routes that were travelled to get to freedom were called “lines.” The network of routes went through 14 Northern states and two Canadian provinces — Upper Canada and Lower Canada. At the end of the line was “heaven,” or “the Promised Land,” which was free land in Canada or sometimes in the Northern states. “The drinking gourd” referenced the Big Dipper constellation, which points to the North Star — a lodestar for freedom-seekers finding their way north. The journey was very dangerous. Many made the treacherous voyage by foot. Freedom-seekers were also transported in wagons, carriages, on horses, and in some cases by train. 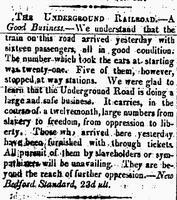 But the Underground Railroad did not only operate over land. Passengers also travelled by boat across lakes, seas and rivers. They often travelled by night and rested during the day. While an estimated 30,000 to 40,000 freedom seekers entered Canada during the last decades of enslavement in the US, the decade 1850­­–60 alone saw 15,000 to 20,000 fugitives reach the Province of Canada when it became the main terminus of the Underground Railroad. The newcomers migrated to various parts of what is now Ontario, including Niagara Falls, Buxton, Chatham, Owen Sound, Windsor, Sandwich (now part of Windsor), Hamilton, Brantford, London, Oakville and Toronto, as well as other regions of British North America such as New Brunswick, Québec and Nova Scotia. During this mass migration, Black Canadians contributed significantly to building strong communities and to the development of the provinces in which they lived and worked. Although out of their jurisdiction, there were a few instances of bounty hunters crossing the border into Canada to pursue escaped fugitives and return them to Southern owners. 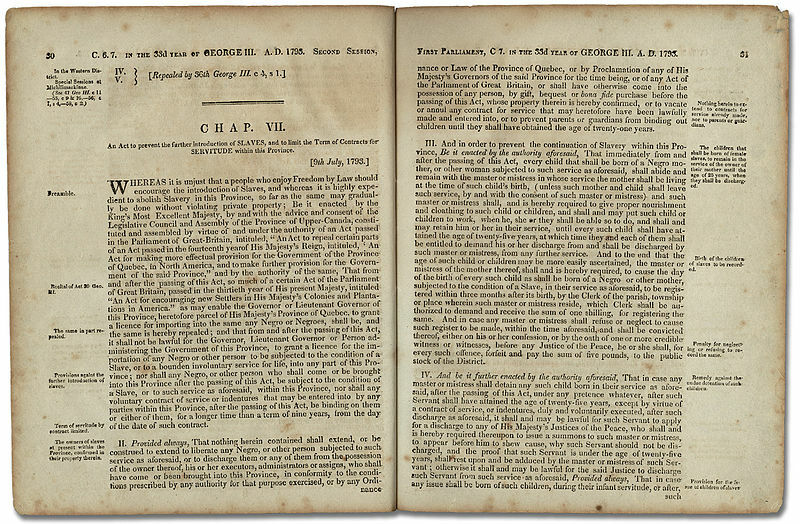 The Provincial Freeman newspaper offered a detailed account of one particular case in which a slave holder and his agent travelled to Chatham, Ontario, which was largely populated by Black persons once enslaved in the US. They were in search of a young man named Joseph Alexander. Their presence was announced and a large crowd of Black members of the community assembled outside the Royal Exchange Hotel. Alexander was among the throng of people and exchanged words with his former owner. He rejected the men’s offer of $100 to accompany them to Windsor. The crowd refused to let the men seize Alexander, and they were forced to leave town. Alexander was left to live in freedom. 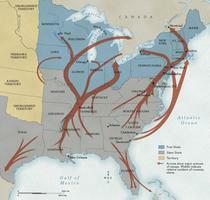 The Underground Railroad operated until the thirteenth amendment to the US constitution banned enslavement in 1865. Freedom-seekers along with free Blacks and the descendants of Black Loyalists settled throughout British North America in small towns and larger city centres. 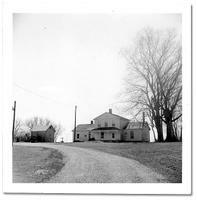 Some lived in all-Black settlements such as the Elgin Settlement and Buxton Mission, the Queen’s Bush Settlement, and the Dawn Settlement near Dresden, in Ontario, as well as Birchtown in Nova Scotia. Others chose to live in racially integrated communities in towns and cities. Early African Canadian settlers were productive and innovative citizens. They cleared and cultivated the land, built homes and raised families. Black persons established a range of religious, educational, social and cultural institutions, political groups and community-building organizations. They founded churches, schools, benevolent societies, fraternal organizations and two newspapers (see Mary Ann Shadd). During the era of the Underground Railroad, Black men and women possessed and contributed a wide range of skills and abilities. They operated various businesses such as grocery stores, ladies boutiques and hat shops, blacksmith shops, a saw company, an ice company, livery stables, pharmacies, herbal treatment services, and carpentry businesses, as well as Toronto’s first taxi company. African Canadians held an array of occupations to support their families and meet the needs of their local communities — including barbers and hairdressers, teachers, farmers, waiters, carpenters, washerwomen, carters, domestic servants, whitewashers, church ministers, farmers, rope makers, dressmakers, blacksmiths, coopers, mariners and dockside workers. Others pursued professions such as medicine and law. Blacks were active in fighting for racial equality. Their communities were centres for abolitionist activities. Closer to home, they waged attacks against the prejudice and racial discrimination they encountered in their daily lives in Canada by finding gainful employment, securing housing, and obtaining an education for their children. Black persons were often relegated to certain jobs because of their skin colour. Many were denied the right to live in particular places due to their race, and parents had to send their children to segregated schools that existed in some parts in Ontario and Nova Scotia. Through publications, conventions and other public events, such as Emancipation Day celebrations, Black communities spoke out against the racial discrimination they faced and aimed to improve society for all. Wherever African Canadians settled in British North America, they contributed to the socio-economic growth of the communities in which they lived. In their quest for freedom, security, prosperity and human rights, early Black colonists strived to make a better life for themselves, their descendants and their fellow citizens. They leave behind an enduring and rich legacy that is evident to this day. The descendants of these courageous men and women continue to lead full, productive lives in Canadian society. Barbara Smucker, Underground to Canada (1978, rev. 2003). Underground RailroadWatch the Heritage Minute about the "underground railroad" from Historica Canada. See also related online learning resources. Tracks to FreedomTravel down the interactive Tracks to Freedom website to learn about the people and events associated with the legendary Underground Railroad. From the Ottawa Citizen. North to FreedomNoted historian and human rights advocate Daniel Hill talks about the importance of the Underground Railway in this 1979 CBC Radio clip. Up From SlaveryAuthor Bryan Walls provides a vivid account of his ancestors’ harrowing escape from enslavement along the Underground Railroad. A University of Toronto website. From Slavery to SettlementHistorical accounts and key documents relating to the abolition of enslavement and the establishment of Black settlements in Ontario. From Archives Ontario. The Underground Railroad: Next Stop, Toronto!This nicely illustrated book offers new insights into the life and times of 19th century Toronto and the intriguing history and heritage of Toronto’s Black community. From indigo.ca.